Trekking through the cold and windy showers of an April morning, one hungry and hopeful foodophile dreamed of a tranquil and tepid morning in Japan. As the rain battered the pavement and my jeans drank from the puddles, the legs sucking up water at record speed speed like a parched plant in the desert, I dived below ground behind a quite understated, unassuming restaurant door along Dublin’s South King Street to be taught by a master the skill of making ramen. 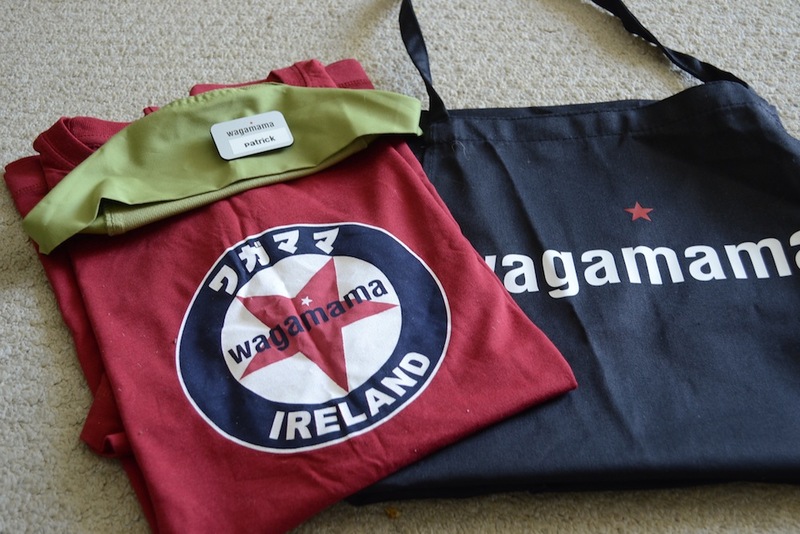 Near the side entrance of Dublin’s St. Stephen’s Green Shopping Centre lies Dublin’s flagship branch of the UK-founded Japanese ramen restaurant, Wagamama. This particular branch has been around for a number of years, the first of many other Irish locations – Blanchardstown, Dundrum, Cork and Belfast – and this branch is certainly the successful benchmark for the company in Ireland. 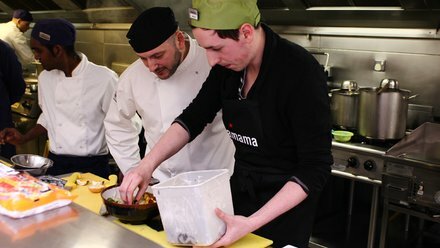 Juan Manteca is head chef and staff trainer for the brand, bringing him throughout the UK and Ireland testing and training budding chefs in the Waga way. 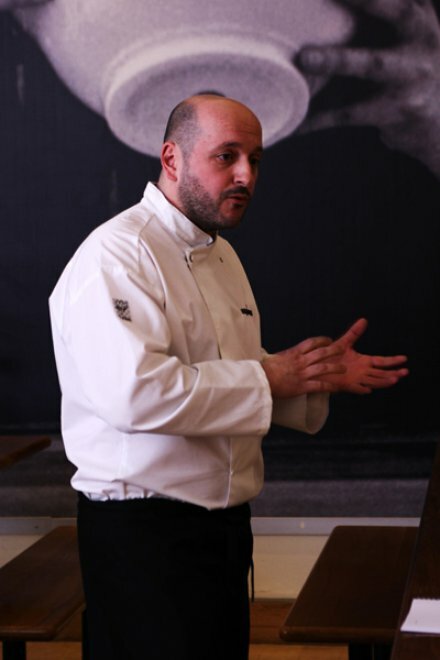 Madrid-born Manteca is currently serving as head chef of the Dublin City Centre restaurant, though has spent time in both Cork and Belfast. He is also a Group Trainer for the chain and was introduced as my teacher for the morning, delivering a master class which has seen Olympians, nutritionists and all form of superstar athletes learn the same skills and knowledge about to be imparted upon our lucky, little group of food writers – who were quickly humbled by the history, delicacy and importance of ramen. Ramen is a Japanese noodle dish, served in the traditional, and now iconic, ‘donburi’ bowl. It consists of a healthy portion of ‘Chukamen’ noodles served swimming in a meat or vegetable broth and finished with a variety of toppings – all complementing one another and developing the taste, texture and colour of the dish, which can be as complex as you like. The key attribute of this historic Japanese dish, though it’s real origins lie in neighbouring China, is the ‘slurp’. Ramen is designed, engineered and expected to be slurped, and with 95 billion portions eaten around the world annually – that’s a whole lot of slurping, though thankfully it’s not all at the same time. However, it’s not considered rude to slurp when eating ramen, its actually rather expected. Juan dove a little deeper into the levels of flavour in ramen, a dish of which the base flavour is derived from the deep, concentrated, slow-cooked stock. He explained the various types of ramen, which are named based upon the broth used; there’s varieties of salt, soy, miso and Tonkotsu – a cloudy, white broth flavoured with pork bones which has recently become the modern and fashionable style to order in the cosmopolitan cities of Europe. 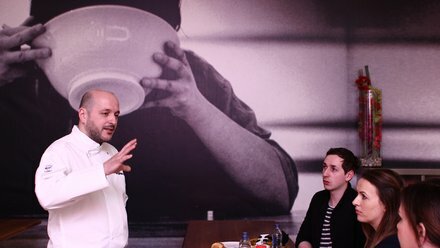 Juan explained that, like any soup or stew, the stock is the most pivotal part of the ramen recipe, and is cooked for at least seven hours, if not for 12 to 20 hours overnight, to achieve the best, most rounded, and deepest flavour. He offered an expert tip that pork trotters and leg bones give the best pork stock flavour, while a whole chicken is best for a traditional chicken stock – not just the carcass. 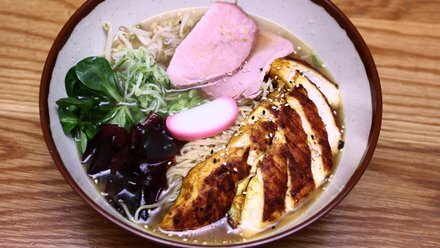 Different meats appear in different ramen, though pork and chicken are the most popular as they are the most widely eaten meats in Japan. Throughout history, and even to this day, the Japanese appreciate the little fresh meat they use in their cuisine and they put a higher emphasis on the vegetables and sauce or stock in a dish. 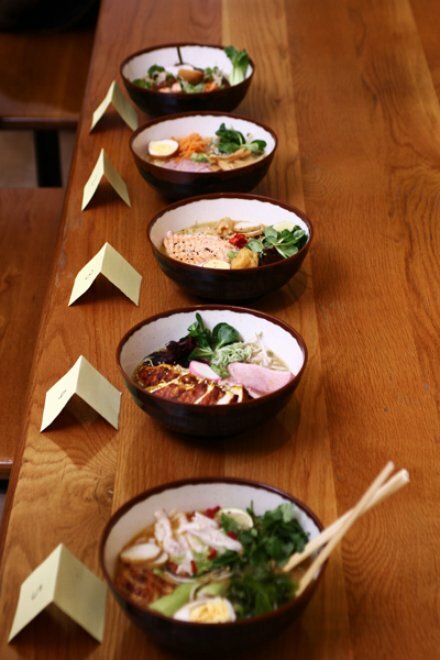 Every ‘Ramen-ya’, that’s a Japanese ramen restaurant to you and I, has it’s own variation on the theme, it’s own recipe for ramen – often kept super secret and handed down through generations. Though some other-worldly tasting recipes are unfortunately shrouded in mystery, the beauty of ramen is the adaptability. Ramen is a dish that’s built in layers from the bottom, deepest, background flavour right up to the freshest and lightest at the top – though this dish is not meant to be overloaded. When choosing toppings, it’s best to choose for flavour and what works well together, rather than all-you-can-eat. Whatever broth, type of noodle and combination of toppings you choose can be as modern and unique, or as traditional, as you wish, making it the perfect dish to experiment with at home. 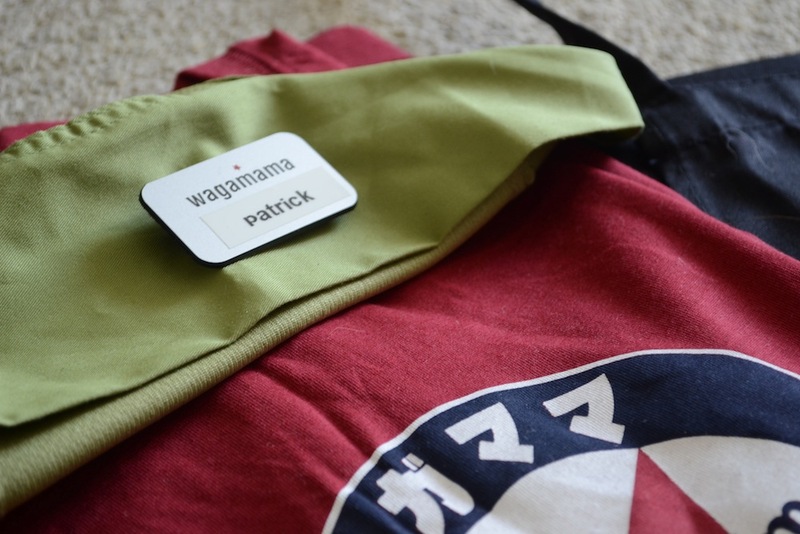 Then came the fun part, I was presented with my very own name tag and Wagamama uniform in order to get behind the kitchen counter and see how the kitchen really operates. 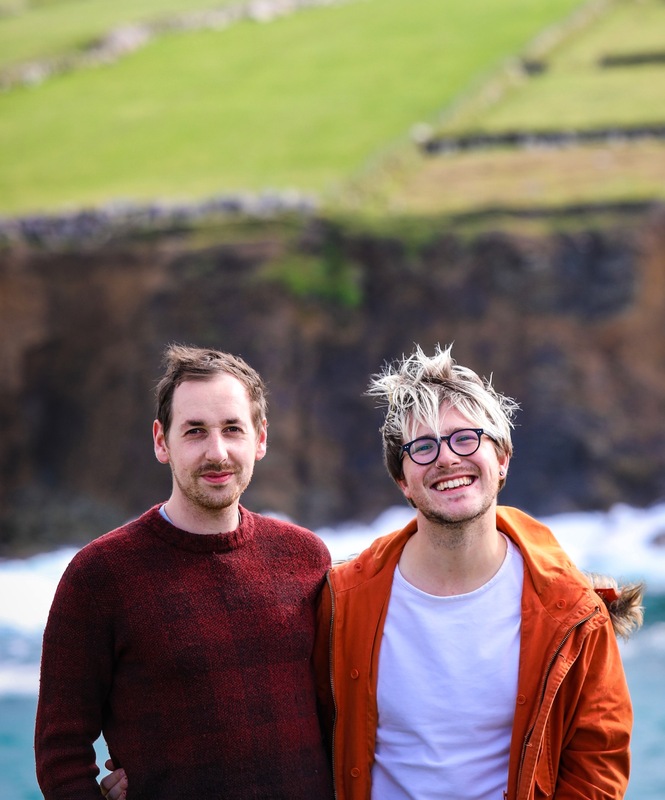 Each of us had the opportunity to ask questions, taste the wide array of fresh ingredients and learn the fast and technical steps of ramen making, before embarking upon our own service and creating a signature ramen dish from our tastes and thoughts. Being at the other side of the pass was a completely new experience to me and served to highlight just how much skill, thought and timing goes in to each dish, and the oft overlooked ramen could very well be the toughest of all to get correct. 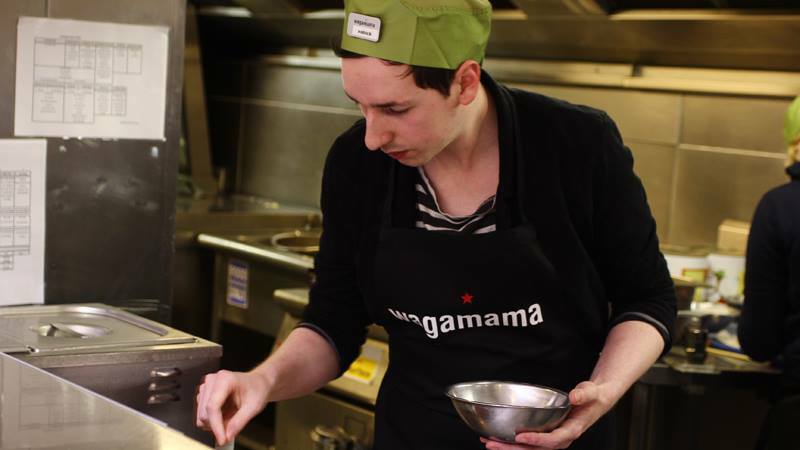 I have a number of years of food preparation service experience, albeit in a fast food company, and that came in handy with following the precise techniques and instructions in preparing a dish to serve to paying punters, but the delicate touch dictated by the ramen section is a seriously acquired skill. Inspired by the fusion on that very morning of Irish and Japanese cultures, I choose to take traditional Irish chicken and ham to the East. My ramen consisted of a pork and chicken broth, lovingly prepared by Juan throughout the night before our master class, which I adapted by stirring in a teaspoon of spiced, earthy miso paste. A bed of noodles and blanched beansprouts sat within the broth, topped with pre-baked ham, medium-sliced and full of similar salty goodness to the broth, and equally thick slices of freshly grilled chicken, which I marinated in white pepper, sesame oil and ground cumin to create a fiery orange colour and a slight earthy, nutty taste. Still fusing East and West, some delicious fresh Irish Dillisk, shredded cucumber and bright baby watercress were my green-hued and fresh-tasting toppings, the dish then finished with a brightly coloured fishcake and a salt, pepper and sesame seed sprinkle. Wholesome and healthy, ramen is a balanced meal as it includes protein, carbohydrates and vegetables, as well as a host of vitamins and minerals. 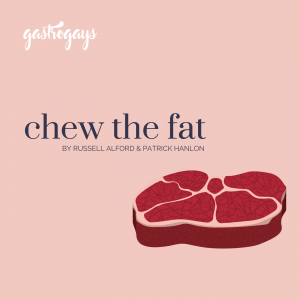 The recipe uses little oil or fat, and for the extremely health conscious, the fat content of your stock can be adjusted by spooning out during or after cooking. It truly is a unique and adaptable dish. 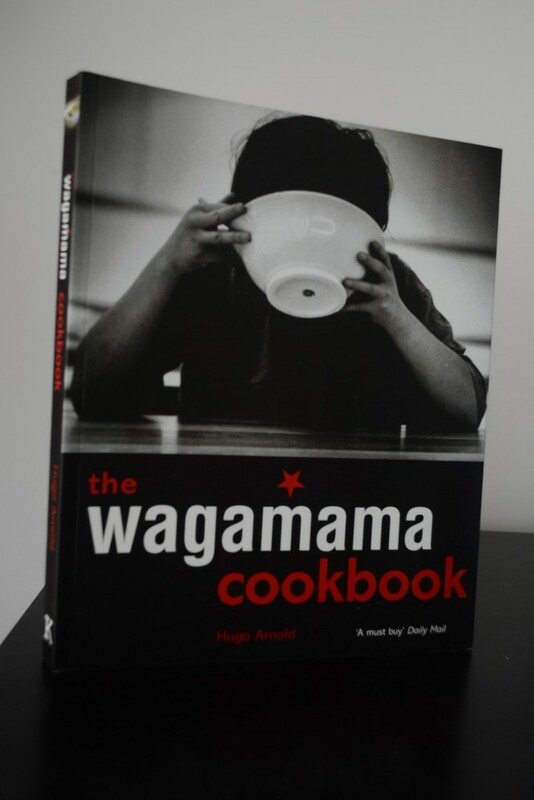 Try the various ramen dishes at your nearest Wagamama, or check out their cookbook to make your own version at home. Slllurrrrrrpppp. 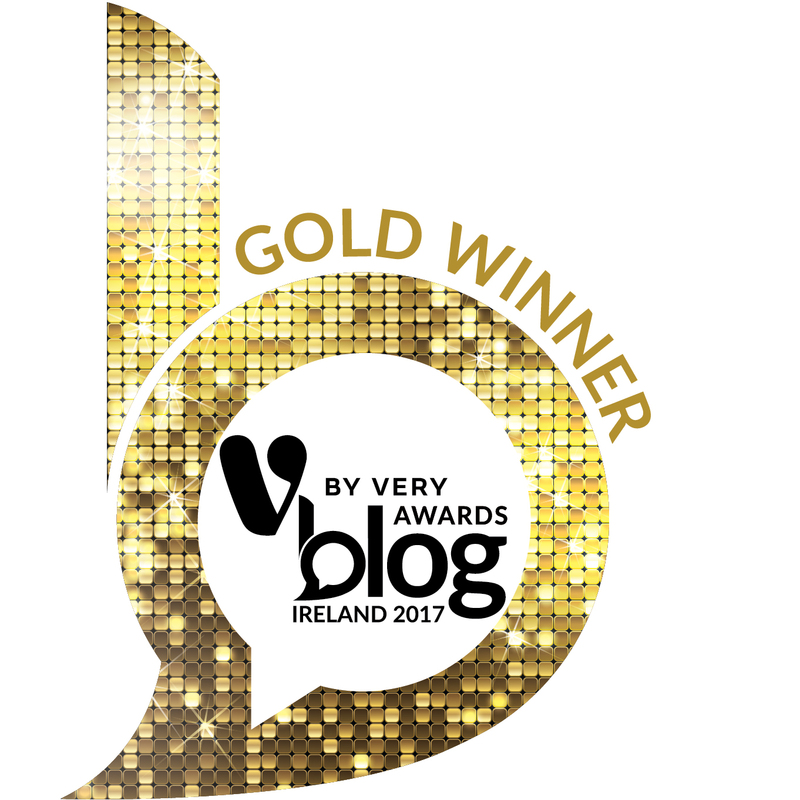 *This feature first appeared, in an edited form, on the RTÉ Food site in May 2013.